Chess is one of the world’s oldest games and has a history as rich as the diversity of its players. Chess is a great equalizer; it knows no boundaries of race, geography, time, or age. Everyone and anyone can play chess and most who try it find there is a special place in their heart and mind for the ancient game. The popularity of the game is credited to the competitive spirit, the game’s rich history, the craftsmanship of the boards and pieces, and the intellectual stimulation it provides. 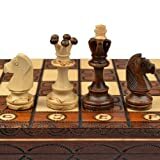 From chess sets depicting famous battles or historic periods to giant chess sets that can be played outdoors, there is a vast variety of chess boards to choose from. A recent trend in the world of chess is vertical chess boards. 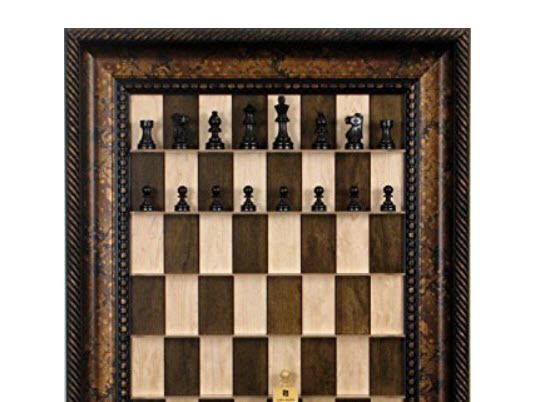 Also known as ‘straight up’ chess boards, they can be safely stored and played on the wall, while serving the additional role as a piece of art. Enjoy the vertical chess boards below that have much to offer their players and owners. This House of Staunton straight up chess board is work of art, as well as an intriguing game of strategy and analytics. This board is part of a red cherry series with a lovely checkered bronze frame. A classic board, this vertical chess board is as practical as it is lovely to look at. These boards are not only for playing on as when mounted on the wall, they become artwork and a conversation piece likely to liven up any space. These boards come highly recommended by players who praise their versatility as they are ideal in an office, games room, family room, library, dorm room, child’s room, or anywhere the chess spirit is likely to strike. This straight up chess board by Chess House is a sight to behold. Its craftsmanship is clear at first glance. Made from CNC beech wood for ultimate longevity and that lovely polished surface. The board comes with pieces made from 3D printed Polyactic Acid – a sustainable thermoplastic resource. The idea of the ‘messenger game’ whereby players play games that go on for days and make a move when they pass the board or whenever they can is based upon the premise that a board can remain up for long periods of time without being disturbed. Vertical boards are ideal for this type of playing as not everyone has the time to complete a game in one sitting. Having a board that is secured to the wall, off the table, and out of the way of prying hands, pets, and accidental bumps ensures that a game can go on for any amount of time. There is even a printed insert that comes with the set to indicate the final move. The board’s dimensions measure 21 7/8″ x 16 3/8″ x 1″. The entire set weighs 5.65 lbs, and the king’s height is 2″. This chess set by Straight Up Chess is designed as wall art and a casual chess game in one appealing package. 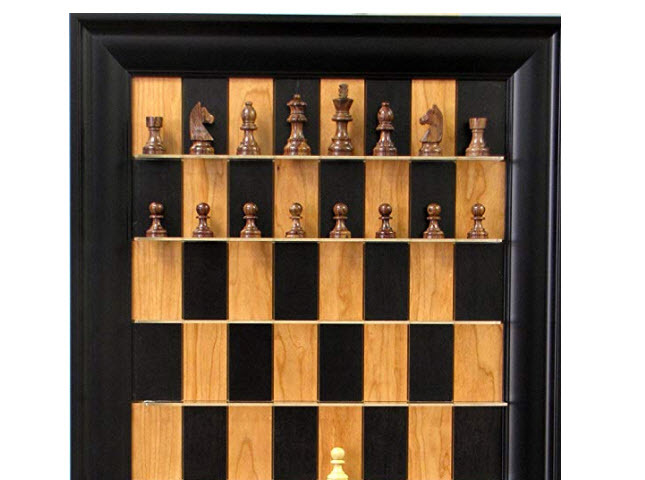 The set features weighted rosewood Fresh chess pieces enhanced by the board’s surrounding dark frame, and the pieces stand upon on narrow acrylic shelves. The messenger style of playing is ideal for this set as it comes with ‘last move’ and ‘check’ markers so a player can make their move, carry on with their day, and make their next move after their opponent has gone. 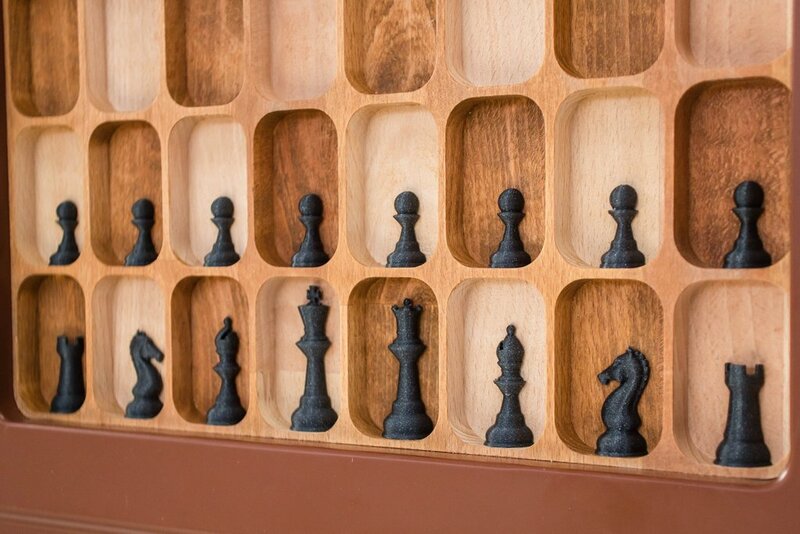 The Straight Up chess boards are American-made and make a fabulous decor item in any space. The board measures 2″ x 21″ x 32″ and weights a total of 14 lbs. This striking chess set features an ornate multi-finished frame around the board and is American-made by Straight Up Chess. The chess pieces are simple, classic, and are weighted. The pieces rest on small shelves. This board is ideal for those wanting to play a casual game without the stress of having to finish up and put the board away. Vertical boards can be left in the middle of the game with the peace of mind of knowing they won’t be bumped into or cleared away by someone else. The board measures 2″ x 22″ x 34″ and weighs a total of 16 lbs. This set would be ideal in a study, library, or a decadent living room. What’s unique about the consummate chess player is that they become as beguiled with the sets themselves as they are with the game. Vertical boards play on the artistic aspect of the game as many of the sets are made from beautiful charming wood and feature hand-carved piece. The warmth and charm of a chess set brings with it the warmth of family time and memories made. Displaying a board on the wall is the perfect means to the end of bringing that warmth and charm into any space it graces. Many even choose to purchase a vertical set for the sole means of a decoration and have another set for playing. The ever-popular messenger style of chess playing refers to those lengthy games that cannot be finished in one sitting. For many, it is unpractical to expect that a board can be left out for an undetermined amount of time without someone else clearing it away or the pieces being accidentally knocked over. Chess boards that are vertical ideal for this type of playing as they are off the table, out of the way, and secured from accidental bumps. Many vertical boards come with markers so players know when their opponent has made a move or when a final move is made. As is the case with most things, there are numerous brands of vertical chess sets to choose from. House of Staunton is a leader in craftsmanship and quality; a board purchased from House of Staunton is synonymous with beauty, longevity, and artisan-quality craftsmanship and design. Straight Up Chess has made a name for themselves with vertical chess sets that are like “playing with art.” They feature numerous sizes and shapes and materials of their sets that are as lovely to look at as they are enjoyable to play. When it comes time to purchase your first vertical chess set, most are available straight from the manufacturer’s website. House of Staunton and Straight Up Chess have shops in Omaha and Alabama but also ship directly from their website. Sites like Amazon have a number of brands available and ship internationally. Of course, there is also a good chance that heading down to your local game shop will produce some positive results. As chess is such a classic and popular game, most game shops carry several different sets to choose from, and with the rising popularity of vertical sets, they are bound to become more commonplace in shops. The prices for vertical chess sets are as varied as they are for regular sets. Depending on the size, material, brand, and finish, prices reflect the quality and craftsmanship of the boards and their pieces. Vertical chess sets seem to range from $290 to $700, with the average falling at around $300. When it comes time to select your vertical chess board, be sure to take size into consideration. If you are purchasing just the board and you already have pieces, you will need to select a board with a square size that is equal or slightly larger than your set’s king. If your set features a 3.8″ king, you will want your board to have 4.0″ squares. 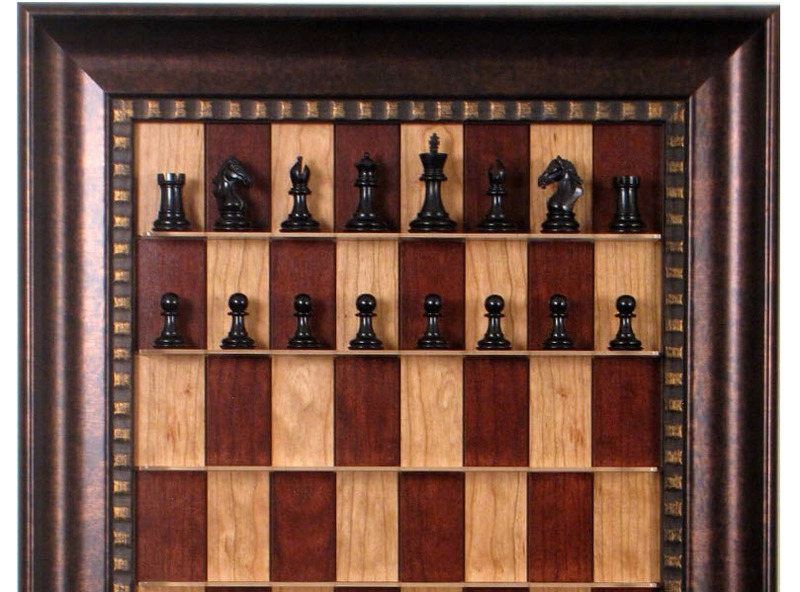 If your pieces and the board are in sync, you only need to determine where you are planning on hanging the board to ensure you have the appropriate wall space; keep in mind that you want enough floor space in front of the board so players can easily and comfortably stop and make their moves when passing by. Pieces that are weighted is also an important feature so they remain securely where they are placed in a move. As your vertical chess board will become part of your decor, select a style that complements its surroundings. Chess board frames come in a variety of colours and styles from dark black to warm wood and simple and traditional to opulent and decadent. The game of chess has players around the world. Children and adults alike have been enjoying the game, its history, and the competitive spirit of forethought and strategy it encourages. From travel-sized and portable to giant outdoor sets and vertical chess boards, the wide variety of styles in which the game can be played further attest to its versatility and playability. So clear a space on your wall, choose your set, and let your playing style evolve one step further to embrace the emerging trend of vertical chess boards.